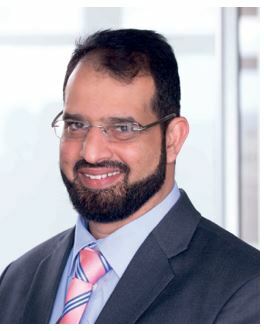 NAEEM ASVAT CA(SA) joined SAICA in 2007 as the Regional Executive for SAICA Eastern Region based in Durban. He is responsible for all SAICA's activities in the region, which comprises primarily KwaZulu-Natal. Prior to joining SAICA, he held the position as senior manager in the Accounting Advisory Services division at KPMG, where he spent ten years, and trained and qualified as a chartered accountant. Asvat's experience has been extensive and includes external and internal audit, forensic investigations, tax compliance and tax consulting as well as various consulting assignments. His career has included a short-term assignment in KPMG's Manchester office in the external audit division, which comprised conversions from UK GAAP to US GAAP (Generally Accepted Accounting Practice). He has undertaken International Financial Reporting Standard (IFRS) conversions in South Africa and Namibia. During his career, he was appointed as a curators' agent of a transport business, which was seized by the Asset Forfeiture Unit (Scorpions) and was appointed as a chief financial officer for an associate of a listed cellular company. Asvat believes that his career is successful because of three things. "Firstly integrity - To me integrity is a mark of a man, without it one's character is left undefined. In light of the changes in the profession, I am going to have to say that integrity holds true for me, as it should for every other profession, and is the most important aspect that I have learned. Secondly, my passion - without passion you cannot succeed. And thirdly, I am willing to step out of my comfort zone and in fact attain the unattainable." He added that he is absolutely dedicated and committed to the work that he does, has an immense passion for work and a great desire for making a difference to society within his sphere of influence. Asvat says that his inspiration comes from "savouring the sweetness of success of someone whom I have helped and inspired, be it a member, a stakeholder, a university student or a learner". He added, "This sweetness is immeasurable and to a certain degree unexplainable. It's indeed gratifying to see these individuals succeed and grow, most especially those from disadvantaged backgrounds and most importantly giving back to the community and having an impact on society." Asvat explained that he came from an average family and grew up in Ladysmith. By the time he started university, his home had been ravaged by six floods in a space of seven years, which virtually left the family with nothing. His father passed on in Asvat's first year at university without having seen his son's results. "The challenges just grew from there on. I did not have funding to go to university but was fortunate enough that before my father passed on he had arranged a loan for me enough to take care of tuition, which I paid back once I started working. I was supported by my mother and siblings, who all contributed to my success." In addition, during his professional journey and the early stages of South African democracy, previously disadvantaged individuals found climbing the corporate ladder a serious challenge, having to constantly prove oneself beyond reproach. He commented, "I thrive on challenges and making the impossible becoming the possible." However, having made his way to senior manager, Asvat was head hunted and joined SAICA. This he said was extremely challenging in the sense that he was catapulted into a leadership position. He was the first black person to be appointed in the 99-year history of the Institute, which had its own set of challenges. "I was forced to learn the environment and terrain rapidly and adapt to change. Suddenly, I was thrust in front of 2 200 members, business and government stakeholders with whom I started engaging and we now have over 4 500 members." In this regard Asvat says, "My personality profile has been somewhat defined as a catalyst and I am goal driven to achieve and persevere." Establishing the first independent SAICA office in KwaZulu-Natal, building the SAICA, and the CA(SA) brand to be a premier recognised business designation, have been highlights of his career. He also counts as highlights serving as a councillor on the KwaZulu-Natal Human Resource Development Council, which is chaired by the KwaZulu-Natal Premier and being the only accounting profession representative. In addition, Asvat has spearheaded a significant transformation project with the KZN Treasury and guided them to becoming a SAICA Accredited Training office. A major future project for him is to see SAICA playing a more significant role in shaping economic policies within KwaZulu-Natal. Asvat comes from a family of five siblings and is happily married with three sons. He credits much of his success to his wife, Fatima and his mother who have played very supportive roles in his career. In his free time, he says, "I enjoy the adrenalin stuff - I have done skydiving, jumping out a plane at 12 000 feet and doing the highest commercial bungee jump in the world at the Blaukrans river." He concludes, "No matter where you come from, hard work and perseverance will bring you success. I have also learned the value of relationship building and networking including building long term relationships. I believe that if you knock at the door long enough the door is bound to open."